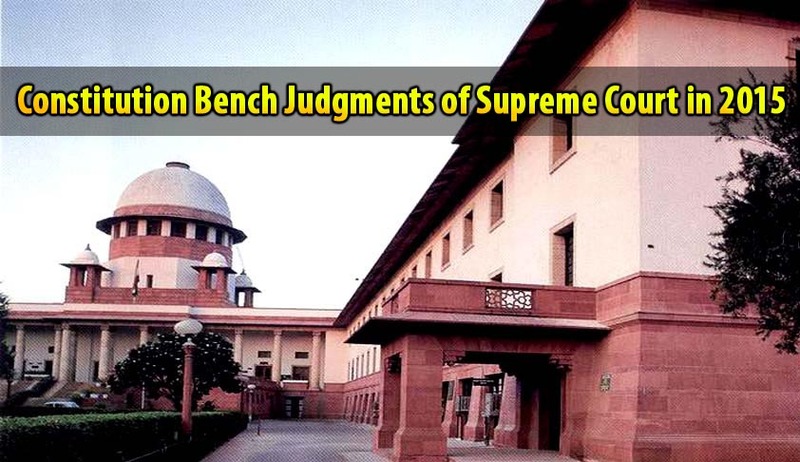 A bench of at least five judges of the Supreme Court which sit to decide any case “involving a substantial question of law as to the interpretation of the Constitution of India” is popularly known as ‘Constitution bench’. Largest ever Constitution bench comprising of 13 judges of the Apex Court had heard the famous Keshavananda Bharati case. More than 75% of the Constitution Bench judgments (1688 out of 2154) were pronounced during the first 30 years of the Apex Court. 3 judgments and an order was delivered by the 5 judge Bench in 2015. In what can be called as a second attempt to challenge the validity of the National Company Law Tribunal and the Appellate Tribunal, the Madras Bar Association challenged their constitutionality yet again (after it failed in its attempt in 2010). The Apex Court dismissed that challenge and said “In para 121 of the  judgment, which is already extracted above, the Court specifically affirmed the decision of the High Court which held that creation of NCLT and NCLAT was not unconstitutional. In view of this, it is not open to the petitioner even to argue this issue as it clearly operate as res judicata”. Though the attempt to challenge the Constitution tribunal went in vain, the Apex Court partly allowed the petition making it clear that only officers who are holding the ranks of Secretaries or Additional Secretaries of the Government of India alone are to be considered for appointment as technical Members of the NCLT. The Court observed that section 409(3) of the Companies Act, 2013 which again makes the Joint Secretary to the Government of India or equivalent officer eligible for appointment, if he has 15 years’ experience as member of Indian Corporate Law Service or Indian Legal Service, out of which at least 3 years’ experience in the pay scale of Joint Secretary is clearly in the teeth of dicta pronounced in 2010 judgment. The Court also held that Section 412(2) of the Companies Act, 2013 is also invalid. Before going into the details of the judgment, it is apt to give a brief timeline of NJAC Bill. National Judicial Appointments Commission (NJAC) Bill and the Constitutional (121st Amendment) Bill, 2014, which establishes the NJAC, was introduced in August 2014 in Lok Sabha. Within three days, both the Houses of Parliament passed it. On 1st January, 2015, it became a Law as President gave his assent to the Bill. The NJAC Act got challenged in Supreme Court. Finally on October 16th 2015, i.e. within 11 months of its enactment, the Constitutional Bench of Apex Court held it is Unconstitutional. It is doubtful whether any other law has met its end this swiftly by the hands of Constitutional bench. Maybe it is for the first time that a Law was held unconstitutional by the Apex Court in the same year it was enacted by the Parliament. In short, The Constitution Bench of the Supreme Court declared National Judicial Commission (NJAC) Unconstitutional as it violates Basic Structure of Constitution of India by 4; 1 Majority. Justices J S Khehar, MB Lokur, Kurian Joseph and Adarsh Kumar Goel declared the 99th Amendment and NJAC Act unconstitutional while Justice Chelameswar upheld it. You can read in detail about the judgment here. Live Law had covered the NJAC hearing quite extensively which can be read here. Exactly two months after scrapping the NJAC Act, a constitution bench of the Supreme Court which had embarked on a mission to improve the collegiums system today virtually put the ball back into the government’s court by giving the Centre the liberty to finalise a draft memorandum of procedure for appointing judges to the Supreme Court and High Courts in consultation with the Chief Justice of India. It can be read here. Holding that life sentence in such cases should mean life in jail till death, Significantly the bench by 3:2 majority upheld the 2008 Swamy Shradananda judgment which said courts can ignore remission right of prisoner in heinous crimes like mass murder and terrorism by awarding sentences ranging from 20 to 40 years unless it is not rarest of rare offences remitting death sentence. A five judge Constitution bench headed by Chief Justice H L Dattu said since the case was probed and prosecuted by the Central Bureau of Investigations, a central agency, the decision should not have been taken without the “concurrence” of the Central government. You can read the Live Law coverage of this case here. Two petitions were referred by Division bench of Supreme Court to the Constitution bench this year. In July, The Division Bench of the Supreme Court comprising Justices Ranjan Gogoi and Rohinton F Nariman referred the question whether the children of illegal migrants born India can obtain Indian citizenship, to a Constitution Bench. Another case which was referred to the 5 judge Bench was related to the Aadhar Card (Justice K.S. Puttaswamy (Retd.) vs. Union of India). The Supreme Court bench constituting Justices J. Chelameswar, S.A. Bobde and C. Nagappan referred the challenges to the Aadhar program to a constitution bench, especially to determine the existence of a right to privacy as a fundamental right. From 11th January 2016, on Mondays and Fridays at 2.00 P.M, Five Judge Constitution bench of the Apex Court would take up the matters published in the list. The entire list can be read here. The Constitution bench is expected to hear or even decide on the issues like passive euthanasia legality and power of Central Government to remove Governor, in 2016. As noted in the beginning, the Constitution bench of Apex Court, which in its early days used to hear scores of cases and pronounce the verdict over it, has only decided only 3 cases this year. Last year it had pronounced verdict of 16 cases. The following table (compare it with the table given here) would give an idea about this falling numbers.